You will have heard me mention distinguished Shetland designer, Hazel Tindall, many times on this blog. 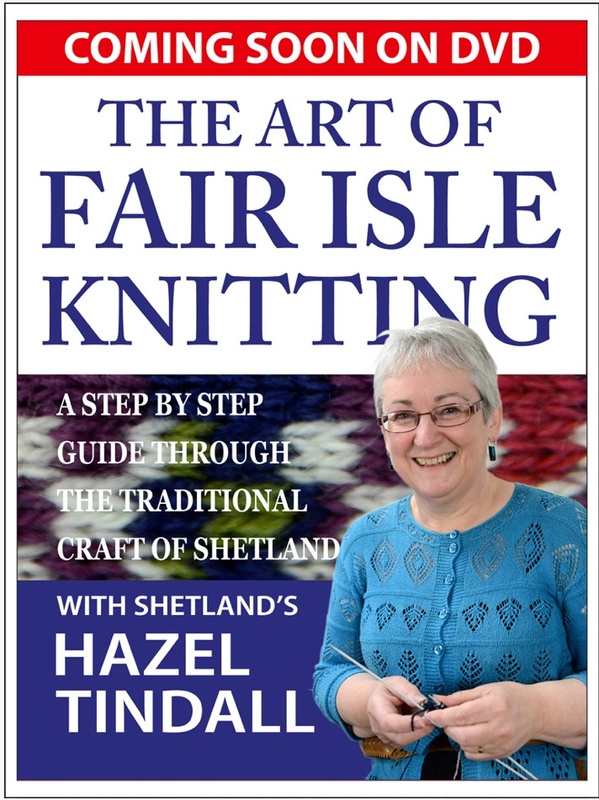 I first met Hazel three years ago, when I was lucky enough to take a workshop with her during Shetland Wool Week. Over the course of the class, Hazel shared her knitterly tips and techniques, talked us through some beautiful examples of her work, and showed us just how she went about designing Fair Isle allover garments. It was a memorable afternoon. I was bowled over by the extent of Hazel’s talent, and by her generosity. Both of these qualities are in evidence in Hazel’s much-anticipated new film in which she demonstrates the creation of a beautiful Fair Isle cardigan from start to finish. 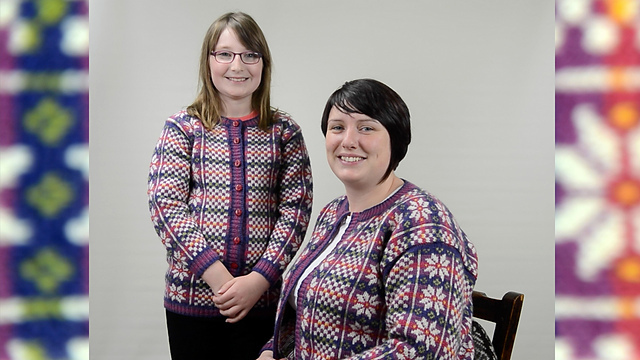 Hazel’s film is a wonderful way to learn more about Shetland knitting, colourwork, and garment construction. The format is innovative and useable, with a cardigan pattern being designed specifically for this film as an accompanying download. 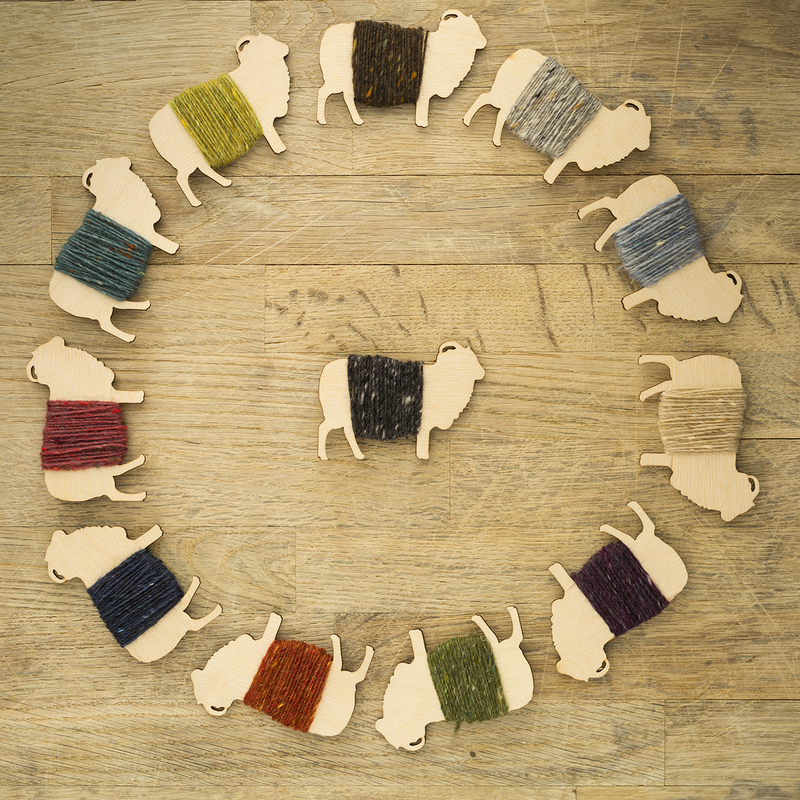 The steps of the pattern and the chapters of the film are cross referenced, making the process very simple and straightforward for the knitter to follow. Hazel’s Shetland Star cardigan is designed using the rich, saturated shades of Uradale Farm’s Double Knitting, a Shetland yarn which has been organically raised and processed. It is a lumber of familiar Shetland construction, featuring vertically placed stars interspersed with dicing, which showcase Hazel’s characteristic use of colour. The pattern comes in 10 sizes (from 23 to 46 ins). The cardigan is knit in the round and steeked, and Hazel shows you from start to finish precisely how to construct and create it. 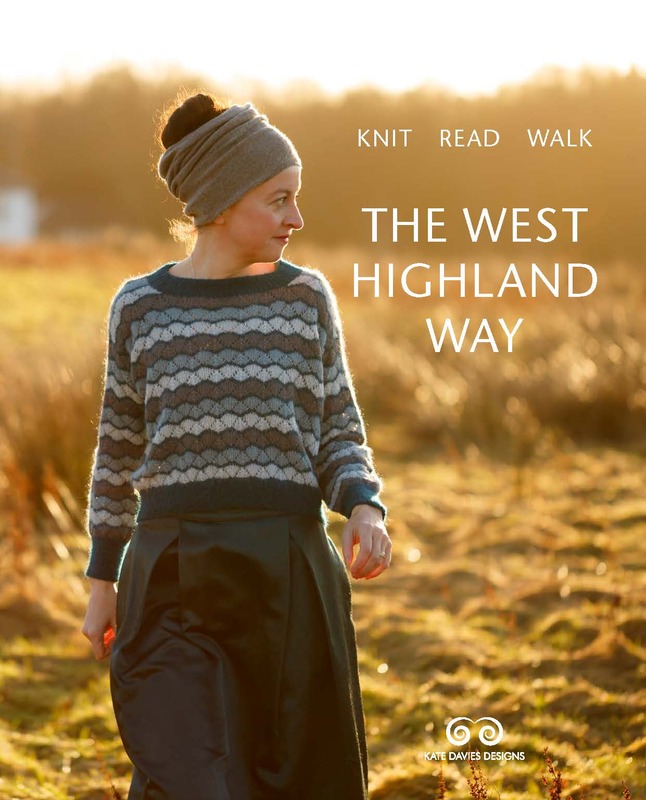 You’ll learn how to swatch carefully, how to insert a pocket into colourwork, how to set up a sleeve and neckline, to cut a steek, to graft and finish the cardigan, and finally how to block a garment on a Shetland jumper board. If Shetland knitting methods are completely new to you, Hazel carefully introduces many objects and techniques that may be unfamiliar: long pins, knitting belt, wrapping string, and the use of cotton thread to create tension during knitting and to secure the fabric while blocking. All stages of the process are carefully illustrated – you really can learn at your own pace. And even if you are an experienced colourwork knitter, you will learn an awful lot from this film. I was both surprised and impressed by many of Hazel’s methods, and shall be immediately adopting her very nifty technique of picking up stitches around a steeked armhole or cardigan front opening. My one proviso is that, if you are a very beginner knitter, Hazel’s film may not be the best learning tool for you. But if you know the basics of stranded colourwork knitting, and want to discover more about this technique, then this film is a true gift. For who better to learn from than a Shetland designer with over 50 years experience, and the world’s fastest knitter to boot? The DVD and download have been beautifully and professionally produced by Dave Donaldson and JJ Jamieson. Both sound and images are clear and sharp, but the film also has a wonderfully relaxed feel, enhanced throughout by the tones of Hazel’s lovely voice. I’ve already spent many happy hours knitting along with, and learning from, The Fine Art of Fair Isle Knitting, and imagine I’ll spend many more. In the final section, poet Stella Sutherland reads her wonderful piece The Allover, an insightful celebration of the “joy of creation” involved in knitting a Fair Isle garment, accompanied by beautiful images of the Shetland landscape. I can’t think of a more fitting conclusion to Hazel’s generous and inspiring film. 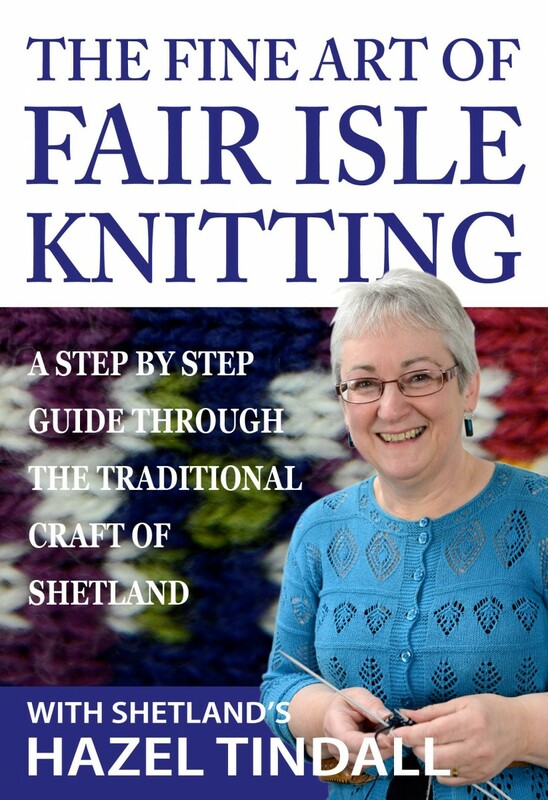 The Fine Art of Fair Isle Knitting is available on DVD or download directly from Hazel’s Website . You are such a source of inspiration…I have downloaded the video and the pattern, just ordered the wool to complete the project…now to add it to my “To Do” list of projects when I finally retire from teaching. 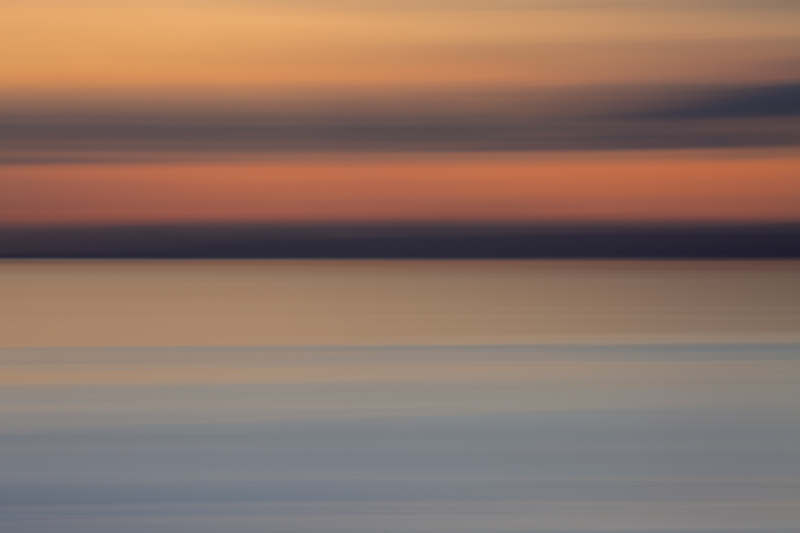 I love her voice and the pictures of Shetland. What a hefty wealth of information. I had the good fortune to meet Hazel during a trip to Shetland this year. She was at the Textile Museum upstairs seated by a window knitting on a cardigan. Being a knitting nerd I was a bit starstruck. She is a delightful and talented person. Thank you for sharing! Thank you, Kate! Though I love complicated and challenging patterns, for some reason stranded colourwork always seemed to me extremely difficult to perform. But your latest posts and your love for the traditional fair isle inspire me to start. I have to knit at least one stranded colourwork swatch now, just to try. This is so exciting! I am in love with Hazel’s beautifully musical accent, and so I probably will have to play several times just to hear her music, before I pay attention to what she is instructing! Thank you for bringing this to us, Kate! It played the third time around. Looks enticing but I could not get the trailer to play. In a serendipitous moment I came across Hazel’s blog about a month ago whilst “Tea Jenny” was on my pins. Previously, my ribbing always blocked out to what became a sort of gelatinous blob. Somewhere in what I was reading (I believe it was her post about wooly boards – may I be so fortunate to own one someday!) there was mention of running string through ribbing for blocking and snugging it up. I did it with “Tea Jenny” and a subsequent pair of Fair Isle gloves and like magic the ribbing dried and behaved like real, functional ribbing! I’m forever in Hazel’s debt and I am certain her DVD is invaluable, especially with “Yokes” coming out soon. It sounds like a great film, I’ve heard nothing but good about it. What makes a cardigan a lumber jacket? I think in Shetland we would call something a “lumber” if it had buttons right up to the crew neck, rather than being a V-neck. Cool thank you, I was asking because my dad has been asking for a lumber jacket, having seen one in a 1940s book I bought. I have been looking at lots of the patterns that describe themselves as lumber jacket, mainly vintage, and wondering what sets them apart from a normal cardigan. The only difference I had noticed so far in the older patterns was that they tended to have a deeper rib. Hi Kate, I am quite an avid knitter and have always wanted to learn stranded knitting as I just love it.Could you recommend a good book that will take me as a beginner to learn the basics properly as I so want to try my hand at it. I also have a question about the basics of stranded knitting. Are there specific requirements for the yarn used? I almost always knit with cotton. Is it suitable for stranded colourwork? Thank you! I can recommend using a “sticky” wool like Shetland wool because the floats stay put and it really is much easier than using a slipperier yarn.